It's only been one day since the new and oh-so-shiny Chromecast was announced, but it looks like app developers are jumping at the chance to take advantage of its new capabilities. First on deck in Netflix, which is a bit surprising since the company hasn't been all that quick on the draw in the past when it comes to functional updates. The latest update in the Play Store adds compatibility with the new Chromecast's Fast Play feature, getting a show or video from your phone to your TV in about one third the time that it used to take. Unfortunately this doesn't seem to work on the older Chromecast with its more antiquated Wi-Fi chip. But I tested the updated Netflix app's Cast function on the NVIDIA SHIELD (which supports 802.11ac and 5ghz Wi-Fi, like the new Chromecast) and an episode of Archer went to my television in just seconds, where the old app took around 15 seconds, a definite improvement. The Nexus Player has the same Wi-Fi capabilities, so users should see improved load times on it as well so long as they have a compatible network. Netflix says that the app also includes "bug fixes" but didn't elaborate on exactly what those are. There's also a new permission to change your phone or tablet's audio settings. The app doesn't seem to be widely disseminating on the Play Store yet, so grab it from APK Mirror if you don't want to wait. Keep in mind that you'll probably need the new Chromecast app to see the improved load times. We've been told by a Netflix representative that Fast Play is not, in fact, enabled. The results quoted above must therefore be a (rather dramatic) fluctuation in the timing of the Cast feature without any intentional change. We apologize for the confusion. 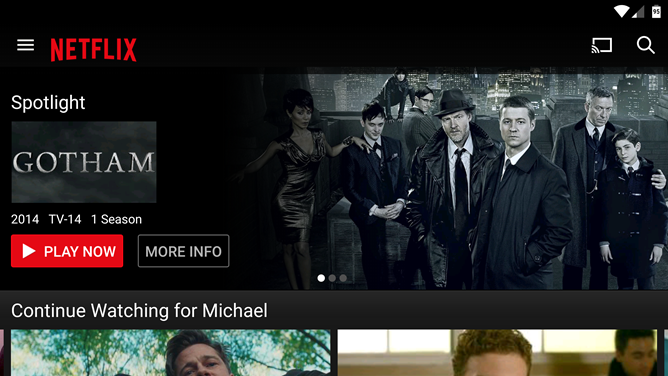 A second update to the Netflix app has been issued today, just a day after the last one. According to the update text, this one adds support for Android 6.0, improves the audio experience on certain Bluetooth devices, and includes the usual bug fixes.